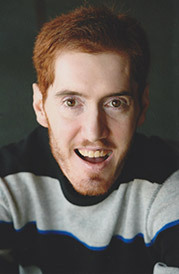 Peter Sonenshein, born in 1984, has lived in suburban Philadelphia all his life. The seeds for his interest in art were sown as a student in a progressive elementary school where he was exposed to a variety of arts and artistic expression; he tried his hand at wood working, weaving, drawing, music and even Shakespeare productions in the 5th and 6th grades. He became particularly interested in cartooning. Pete has lived with a rare neurological condition all his life, and that has given its unique expression to his work. He believes that painting and drawing help him deal with the uncertainty and anxiety that his condition causes. 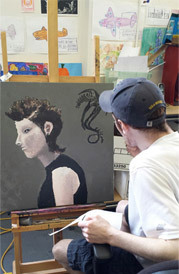 Pete began private art lessons in earnest in 2012 at The Oasis Art Center in Philadelphia. 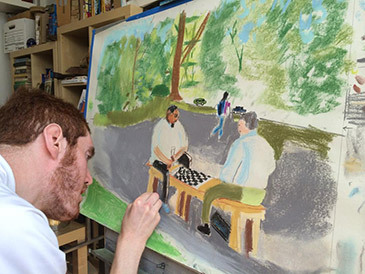 Besides discovering a talent and a joy in painting, he found that the sense of community helped to alleviate some of the isolation that resulted from his illness. He considers himself a “fighter” who never gives up when unpredictable bouts of illness strike. He enjoys the sense of accomplishment that completing a piece of art brings. Although the Oasis Art Center had to close its doors in the spring of 2014, Peter continues to pursue his art and instruction, and has found a number of outlets to show his work. He plans to continue experimenting with new materials and styles, and is interested in working collaboratively with other artists within the broader arts community.